Apple’s HomePod: do we have any idea how popular it actually is? Photo by Joe Wilcox on Flickr. A selection of 10 links for you. Somewhere, it’s Friday. I’m @charlesarthur on Twitter. Observations and links welcome. For many years, the main goal of the Netflix personalized recommendation system has been to get the right titles in front each of our members at the right time. With a catalog spanning thousands of titles and a diverse member base spanning over a hundred million accounts, recommending the titles that are just right for each member is crucial. But the job of recommendation does not end there. Why should you care about any particular title we recommend? What can we say about a new and unfamiliar title that will pique your interest? How do we convince you that a title is worth watching? Answering these questions is critical in helping our members discover great content, especially for unfamiliar titles. One avenue to address this challenge is to consider the artwork or imagery we use to portray the titles. If the artwork representing a title captures something compelling to you, then it acts as a gateway into that title and gives you some visual “evidence” for why the title might be good for you. A Netflix homepage without artwork. This is how historically our recommendation algorithms viewed a page. Artwork for Stranger Things that each receive over 5% of impressions from our personalization algorithm. Different images cover a breadth of themes in the show to go beyond what any single image portrays. Gryn estimated that users of his tracking software place $400m worth of ads a year on Facebook and an additional $1.3bn elsewhere. (He later showed me reports that roughly support those figures.) It’s not just affiliates who think Gryn is at the pinnacle of the industry. In June, just before the conference, Facebook’s newly installed executive in charge of fighting shady ads, Rob Leathern, had invited him to the company’s London office to explain the latest affiliate tricks. Rob Leathern is straight-up focussed on getting rid of scam ads; the startup he ran before Facebook bought it was all about killing ad fraud (which I know infuriates him), and he hasn’t let up on that since joining it. Let’s hope that Gryn’s session with him helps stamp this stuff out. Gene Munster, a co-founder of Loup Ventures and a long-time Apple watcher, expects HomePod sales to pick up in the holiday shopping season. He says Apple will probably sell 7 million HomePods this year and close to 11 million in 2019. By contrast, Munster predicts that Amazon will sell 29 million Echos this year and 39 million in 2019. Alphabet, he estimates, will move 18 million Google Homes in 2018 and about 32 million the following year. 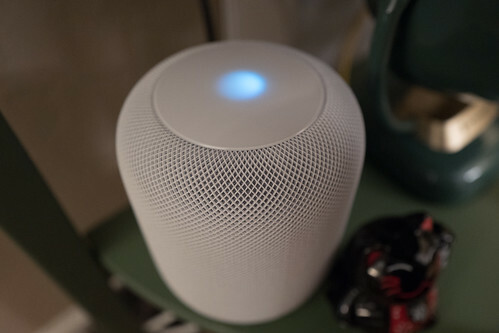 The HomePod will almost certainly improve. Not every Apple product was a hit out of the gate. The Apple Watch faced challenges when it launched, too, and is now widely recognized as the top performing smartwatch on the market (although still a tiny part of its maker’s business). The HomePod bears some consideration. It’s a really good speaker (pair it with an Apple TV and you have a soundbar for that output) but it isn’t trying to be the things that the Echo range or Google Home range are. You can view that as a failure, on the basis that Amazon and Google have defined the category, or that it’s most focussed on the thing people want a good speaker to do: play music. But today I was also wondering about the inability of any Apple device to run two timers at once (something which Echo and Google Home devices do), and thinking there are some real blind spots in Apple’s view of the world. Seven million is a good number of devices, but it’s hard not to think that these devices are mutually exclusive. Apple Music is thinking globally as the streaming service officially surpasses 40 million paid subscribers. Today, the company announced the promotion of Oliver Schusser to lead Apple Music Worldwide. His new title is vice president of Apple Music & International Content. Schusser has led efforts outside the U.S. related to the App Store, iTunes’ movies and TV portals, iBooks, Apple Podcasts, and more. He has worked closely with Apple svp of Internet Software and Services Eddy Cue, who hired Schusser some 14 years ago and also announced his promotion to staff earlier this morning (April 11). There’s quite the PR tussle going on between Apple and Spotify for the announced number of subscribers. The story also says there are 8m “auditioning” via free trials, which gives an idea of its churn/conversion rate – which seems pretty favourable – and that in the US it’s growing at 5% per month in the US, vs 2% for Spotify. Schusser was based in London, where he worked on the Shazam acquisition. (Apple owns it now.) But now he’s off to Cupertino and LA. Better weather, for sure. A two-year-old boy in Shanghai disabled his mother’s iPhone for the equivalent of 47 years after playing with it and repeatedly entering the wrong passcode, according to a Chinese media report. The incident happened in January after the phone was given to the child to watch educational videos online, the news website Kankanews.com said. The mother returned home one day and when she checked the phone found it had been disabled for 25 million minutes by pressing keys repeatedly when the handset requested the passcode be inputted, according to the article. Each time the wrong keys were pressed the phone was disabled for a period of time, the report said. Marques Brownlee likes the fact that he still has a bit of anonymity — despite having more than six million subscribers on YouTube and more than 2.75 million followers on Twitter, he can go almost anywhere without people accosting him in public. But when he goes to tech conferences like CES, he gets bombarded with attention. Although making YouTube videos started as a hobby, his channel MKBHD’s massive reach has caused the tech giants to take notice: When the Samsungs and Apples of the world have a new phone coming out, Brownlee is one of the people invited to those products’ unveilings, in the hope that he’ll make a video about the new product that will attract millions of views. Worldwide shipments of traditional PCs (desktop, notebook, and workstation) totaled 60.4m units and recorded flat (0.0%) year-on-year growth in the first quarter of 2018 (1Q18), according to the International Data Corporation (IDC) Worldwide Quarterly Personal Computing Device Tracker. The results exceeded the earlier forecast of a 1.5% decline and marks the third consecutive quarter where traditional PC shipment volume has hovered around flat growth year on year. Although the numbers are preliminary, the data seems to indicate a continued build up in commercial renewal activity as the main driver for the stabilizing trend. Business uptake of Windows 10 systems appear to be steadily ongoing, benefitting commercially-focused PC OEMs such as HP, Dell, and Lenovo. Demand for premium notebooks in both the consumer and commercial segments have also helped major vendors retain better margins and garner buyer interest. Furthermore, continued focus on gaming systems has injected slight improvement in pockets of the consumer space. Unlike the first quarter of 2017, an improved supply of key notebook components also loosened pressures on both supply and pricing, leading to some recovery of share for the smaller vendors. The Gartner data is gloomier – a fall of 1.4%, though to a higher total of 61.69m units. The confusing thing is that Gartner excludes Chromebooks, but IDC includes them; but Chromebook sales would probably explain how IDC sees sales as static while Gartner sees them falling. Either way, the PC market is a long way down; in 1Q 2012 IDC’s figures were showed shipments of 88m. Somewhere, 28m sales got lost. Security Research Labs (SRL) tested the firmware of 1,200 phones, from more than a dozen phone manufacturers, for every Android patch released in 2017. The devices were made by Google itself as well as major Android phone makers like Samsung, Motorola, and HTC, and lesser-known Chinese-owned companies like ZTE and TCL. Their testing found that other than Google’s own flagship phones like the Pixel and Pixel 2, even top-tier phone vendors sometimes claimed to have patches installed that they actually lacked. And the lower-tier collection of manufacturers had a far messier record. More often, Nohl believes, companies like Sony or Samsung would miss a patch or two by accident. But in other cases, the results were harder to explain: SRL found that one Samsung phone, the 2016 J5, was perfectly honest about telling the user which patches it had installed and which it still lacked, while Samsung’s 2016 J3 claimed to have every Android patch issued in 2017 but lacked 12 of them—two considered as “critical” for the phone’s security. Chinese companies (including Lenovo’s Motorola), and HTC and LG figure badly here. How big a problem is this, though? Are these hacks exploitable? The rest of the article suggests not. But it’s poor customer relations to do this. here in California, Assemblymember Mark Levine has introduced a local version of the [EU’s data protection regulation] GDPR, called the California Data Protection Authority, which includes two key components: a form of a right to be forgotten and a plan for regulations “to prohibit edge provider Internet Web sites from conducting potentially harmful experiments on nonconsenting users.” If you’re just looking from the outside, both of these might sound good as a first pass. Giving end users more control over their data? Sounds good. Preventing evil websites from conducting “potentially harmful experiments”? Uh, yeah, sounds good. It is the intent of the Legislature to ensure that personal information can be removed from the database of an edge provider, defined as any individual or entity in California that provides any content, application, or service over the Internet, and any individual or entity in California that provides a device used for accessing any content, application, or service over the Internet, when a user chooses not to continue to be a customer of that edge provider. Any content? Any application? At least the bill does limit “personal information” to a limited category of topics, so we’re not just talking about “embarrassing” information, a la the EU’s interpretation of the right to be forgotten. But “personal information” is still somewhat vague. It does include “medical information” which is further defined as “any individually identifiable information, in electronic or physical form, regarding the individual’s medical history or medical treatment or diagnosis by a health care professional.” So, would that mean that if we wrote about SF Giants pitcher Madison Bumgarner, and the fact that his broken pinky required pins and he won’t be able to pitch for a few weeks… we’d be required to take that information down if he requested it? That seems like a pretty serious First Amendment problem. The “right to be forgotten” clashes fundamentally with the US’s First Amendment. But the GDPR doesn’t have to, if it’s about the initial control of data. The clash comes once the data has become “public”. As provocative as it may be to European regulators, the better conception may be to see the new law as incompatible with the reality of open blockchain networks. That is to say, the GDPR presumes that there will be central intermediaries that can ‘erase’ information, but the world is trending toward ever more decentralized and immutable technologies. While firms may alter their behavior to comply with the new law, decentralized networks are global and unowned and won’t change. The result of the law, then, may be that Europe is closing itself off from the future of the Internet to its detriment. That said, we’re optimistic that our European friends will come to see that their legitimate privacy concerns are best addressed not through law, but through decentralizing technology itself.